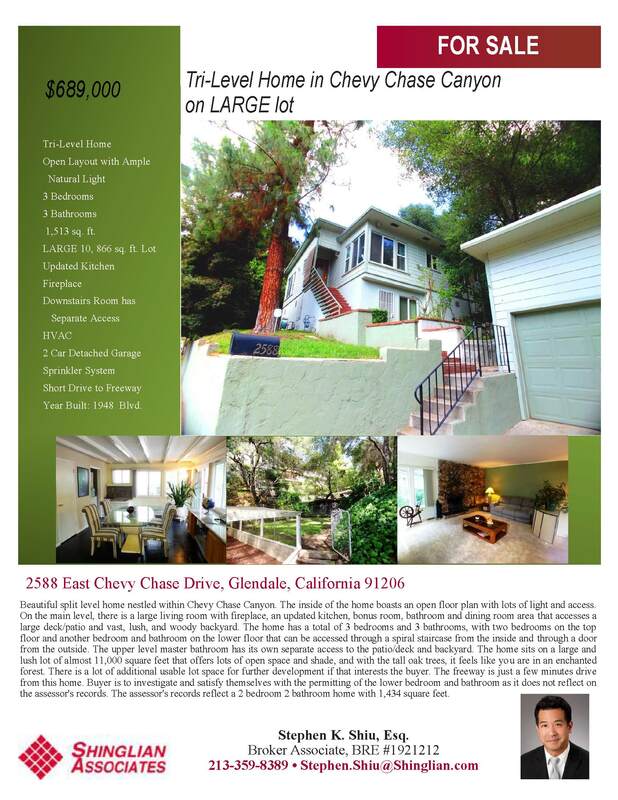 Below is a flyer for my new listing, 2588 East Chevy Chase Drive, Los Angeles, CA 91206, a beautiful split level home nestled within Chevy Chase Canyon. The home boasts 1,513 sq. ft. of living area and has 3 bedrooms and 3 bathrooms per the seller’s appraisal. The inside of the home boasts an open floor plan with lots of light and access. On the main level, there is a large living room with fireplace, an updated kitchen, bonus room, bathroom and dining room area that accesses a large deck/patio and vast,lush, and woody backyard. Two bedrooms, including the master bedroom, are located on the top floor and another bedroom and bathroom on the lower floor that can be accessed through a spiral staircase from the inside and through a door from the outside. The upper level master bathroom has its own separate access to the patio/deck and backyard. The home sits on a large and lush lot of almost 11,000 square feet that offers lots of open space and shade, and with the tall oak trees, it feels like you are in an enchanted forest. There is a lot of additional usable lot space for further development if that interests the buyer. The freeway is just a few minutes drive from this home. Buyer is to investigate and satisfy themselves with the permitting of the lower bedroom and bathroom as it does not reflect on the assessor’s records. The assessor’s records reflect a 2 bedroom 2 bathroom home with 1,434 square feet. 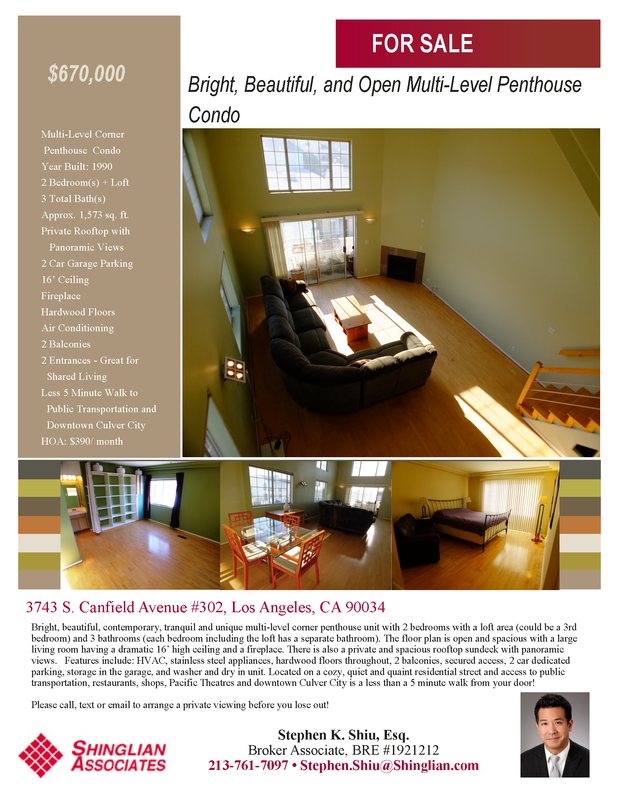 I just sold this single family home in Studio City last week! I represented the seller and was able to secure a significantly above asking price offer from a buyer client within the first weekend of being on the market. Both the seller and buyer are happy with the outcome! Contact me for all of your real estate needs, brokerage and/or legal! 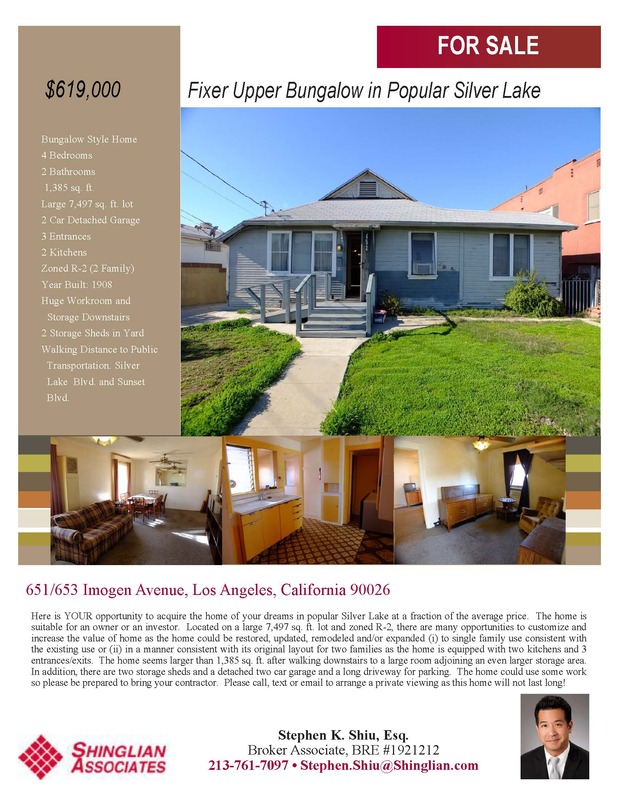 Below is a flyer for my new listing, 651 Imogen Avenue, Los Angeles, CA 90026, a 1,385 sq. ft. bungalow with 4 bedrooms and 2 bathrooms. 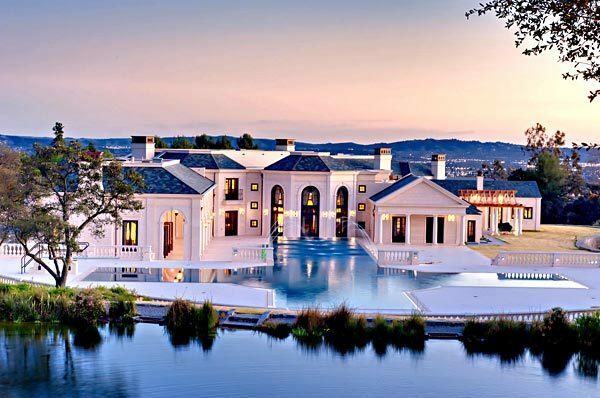 The home seems larger than 1,385 sq. ft. after walking downstairs to another large room adjoining an even larger storage area. In addition, there are two storage sheds and a detached two car garage and a long driveway for parking. Located on a large 7,497 sq. ft. lot and zoned R-2, there are many opportunities to customize and increase the value of home as the home could be restored, updated, remodeled and/or expanded (i) to single family use consistent with the existing use or (ii) in a manner consistent with its original layout for two families as the home is equipped with two kitchens and 3 entrances/exits. The home could use some work so please be prepared to bring your contractor. Priced at $619,000, this home presents an opportunity to own in Silver Lake below the median sales price and to customize a home to your liking. Please contact me for a showing or if you have any questions. Curbed recently noted that Silver Lake was the hottest real estate neighborhood in 2014 (http://la.curbed.com/archives/2014/12/silver_lake_was_las_hottest_real_estate_neighborhood_in_2014.php) with the median home sales price being $822,000, 56% of homes sold over asking prices, and homes in the neighborhood lasting a short 15 days on the market. The residential real estate market has been an extremely popular topic among investors and first time home buyers. As noted in my earlier post (http://sksreal.com/la-real-estate-hits-bottom/), residential real estate prices bottomed out in early 2012. Taking a look back at 2012, Southern California’s housing market ended last year on a positive note with sharp home-price gains and the highest sales for a December in three years. The region’s median home price (which is the point at which half the homes in the region sold for more and half for less) rose 19.6% in December over the same month last year to hit $323,000, real estate firm DataQuick reported. An estimated total of 20,274 new and previously owned homes and condominiums sold throughout the six-county region. That was a 5.1% increase from November and up 5.3% from December 2011. Sales of foreclosed homes made up just 14.8% of the market last month, down from 15.4% the month before and 32.4% in December 2011. That compares with a high of 56.7% of the market in February 2009. Increased home prices are a result of low supply and high demand. Much of this demand comes from a record level of cash buyers and investors that include institutional investors, “mom and pop” investors, and foreign investors (e.g., from China) who have had, in the recession, few viable real estate product types to invest in. Cash buyers bought up 33.8% of all resale homes last month, while absentee buyers purchased 29.1% of Southland homes in December, DataQuick said. 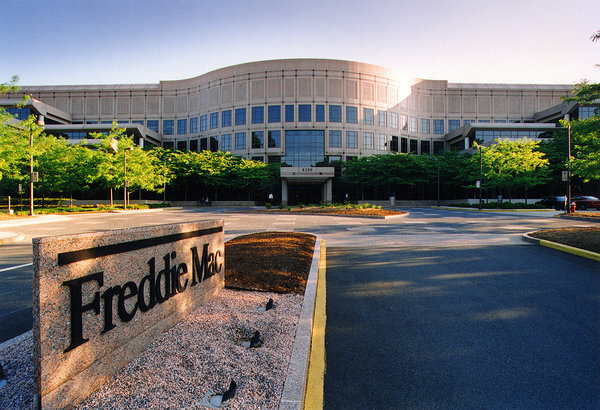 In addition, low interest rates (3.42% for a 30-year fixed mortgage as of last week per Freddie Mac) motivate buyers without “all cash” to finance their home purchases. In California, buyers can anticipate little new inventory on the market. A supply of only about 2 1/2 months’ worth of single-family homes for sale was available statewide at the end of December, based on a report from the California Association of Realtors. To the dismay of the average homebuyer, inventory is especially tight for homes below $500,000. However, this could mean for less competition for homes above $500,000. Last year was the first year of solid improvement since housing crashed in 2007. Data indicates that 2013 will also continue to bring home price gains. Therefore, now is the time to act while homes prices remain low and interest rates are at a historical low if you are in the market for a home. This makes even more sense if the home will be owner occupied as the rent to mortgage ratio (based on adjusted rent for Los Angeles against a 100% loan-to-value mortgage (30-year fixed) for the median price home using Realtor home sales statistics) for the Los Angeles area is at a buyer friendly .76 in September 2012 , and this does not include any applicable mortgage tax deduction. 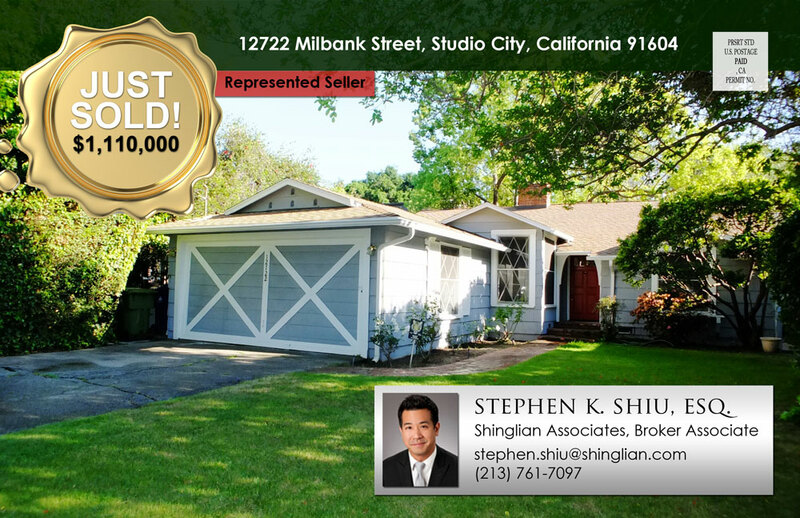 The author, Stephen K. Shiu, Esq., is a real estate attorney and broker (CA DRE # 1921212) who offers clients real estate legal and brokerage services. For more information about these services, please visit www.sksreal.com. Stephen can be reached at (213) 359-8389 or via email at: sshiu@sksreal.com. By Stephen K. Shiu, Esq. I see it happen all the time. Landlords who are sympathetic to tenants and who fail to wake up and smell the coffee can easily be deprived of rental income for 6 months or more! I’m currently trying to convince a family member to commence eviction proceedings against a tenant that has not paid rent for 3 months. I’ll call this family member Joe. Joe, being a nice guy, erroneously, believed every single excuse of the tenant as to why rent was not paid and every single promise by the tenant of future rental payment. The tenant is now trying to negotiate a move out day after the lease term and approximately 4 months after rent was last paid, which is really another stall tactic. Had Joe commenced eviction proceedings immediately after the tenant failed to pay rent, Joe may have only been deprived of 1 month of rental income. This article encourages similarly sympathetic landlords to take immediate action against nonpaying tenants. Tenants will make all kinds of excuses for failing to pay rent and make you think missed rent will be forthcoming. Why? Tenants don’t want to move, the economy is bad and many people are unemployed, housing is not cheap, and when desperate, a tenant will say anything to squat. Property managers and most experienced landlords are no strangers to tenant excuses and commence eviction actions shortly after a tenant fails to pay rent. However, many inexperienced landlords are sympathetic to a tenant’s excuses for not paying rent. And, like clockwork, after the tenant fails to pay the current month’s rent, the tenant will make other excuses for not pay the following months’ rent. This will repeat until the landlord realizes that the tenant has no intention or ability to pay rent. Months 1-3: The tenant asserts numerous temporary hardships preventing the payment of rent. It takes a sympathetic landlord about 3 months to realize that the tenant has no intention or ability to pay rent. Months 4-5: It takes at least 1 month to evict a tenant. Crafty and counseled tenants will delay this process by fabricating challenges to the eviction or even enlisting the help of others to fabricate a claim of a right to possession of the leased premises pursuant to a made up sublease or assignment of lease (add approximately 15+ days for this). And after you finally get a judgment in your favor and finally arrange for the sheriff to force the tenant out of the leased premises (remember that there is no right to self-help eviction in California), the tenant or one of the occupants, all of a sudden, declares bankruptcy (add approximately 1 month or more, plus additional attorney fees to get this resolved and out of bankruptcy court). Month 6: The tenant, having nothing left to lose and angry at the landlord, has damaged or destroyed the premises (e.g., removing fixtures, appliances and/or copper). Be prepared to incur costs repairing and restoring the premises and factor in the time to lease the premises to a new tenant. The landlord cannot effectively enforce a money judgment for unpaid rent and damages because the former tenant has no assets. While many tenants find themselves out of a job in today’s economy, landlords also have mortgages and other expenses to pay. Few landlords can afford to be out of rental income for even a few months, let alone 6 months or longer. Also, there are tenant attorneys skilled at delaying and defending eviction actions. 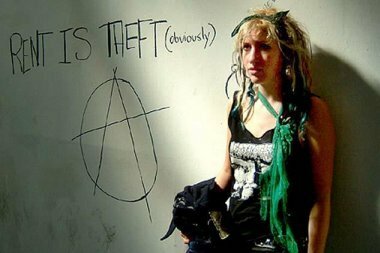 One attorney claims to have kept a tenant in a home for 14 months! To avoid a situation like this, landlords should properly screen tenants by verifying income, and adding all occupants to the lease as tenants to increase the chances of recovery, and checking credit, an unlawful detainer registry to see if a prospective tenant has been evicted before, and references. Nice landlords, please wake up and smell the coffee and consult an attorney familiar with eviction and landlord-tenant matters when your tenant fails to pay rent. Failing to properly notice a tenant for failure to pay rent or failing to adhere to eviction procedures will delay or jeopardize the eviction. The author, Stephen K. Shiu, Esq., is a real estate attorney and broker (CA DRE # 1921212) who offers clients a broad range of real estate services, which include eviction assistance. For more information about these services, please visit www.sksreal.com. 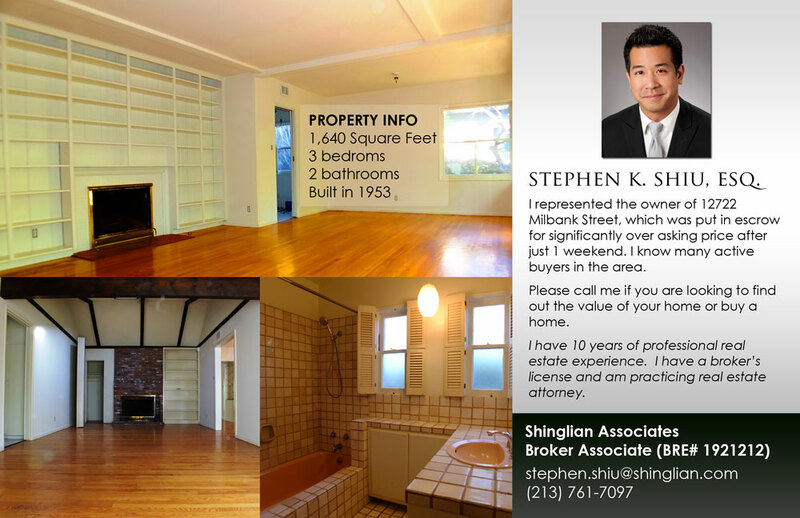 Stephen can be reached at (213) 359-8389 or via email at: sshiu@sksreal.com. For a home buyer, continued low interest rates only increase the competition for homes that are in short supply in the Los Angeles area. Therefore, a home buyer will need to make a more competitive offer – either by offering a higher price and/or making an offer that is less dependent on financing. On the flip side, these low interests rates greatly benefit a homeowner seeking to refinance his or her property. A down payment in the case of a home buyer or equity in the case of a refinancing homeowner of 20% of the home’s value is typically required to get these rates. Time to break open your piggy bank and grab your money from underneath the mattress. Zillow reports that the residential bottom occurred in Q1 this year and LA home prices are expected to keep rising. Click here for full article. Copyright © 2012-2016 Stephen K. Shiu Real Estate and Law. All rights reserved.